I like this meal. I mean, it’s not bad. Today’s fruit cup didn’t taste super sugary so I just think the fruit is floating in fruit juice versus added sugar like HFCS. A reader emailed me to say that she feels so badly about what I’m eating that she can no longer check the blog frequently. She said it’s always the same thing and that it’s hard to watch me eat it. I know it’s tough to see. I just think about the kids. There is an undeniable shock value to the pictures. I can’t believe I have eaten more than 80 school lunches! I have made an appointment to see an allergist for late this month. And in June I’m going to go get blood drawn and compare it to my previous stats from December. As I explained in previous posts, I had a basic panel run in December so that I could get a discount on my health insurance for 2010. It was a coincidence that the information is a baseline for the project. I find it interesting that you had meatloaf and meatballs two days in a row. Can they at least space it out a day or two? Sloppy Joes tomorrow???? I notice a lot of people acting very quesy while reading your posts, or explaining how you are some great, big hero. Indeed, it's wonderful that someone is chronicling the lunches of student, but really, school lunches are not that bad. They really do not seem that bad; as for the reader whose comment you published above? A wimp. Harsh but honest. Some people may say "Eat those lunches yourself, you'll see how gruesome they are!". Gladly. I'll eat them. The main problem here is the time alotted for the students to eat, but not the food itself. How is that broccoli cooked? Steamed? It looks soggy. I certainly don't think of myself as a hero. But I wouldn't call someone else a wimp. I don't care what anyone says – I would feel so sick eating that food every day. It is WAY too processed for me. The "meat" looks completely inedible. 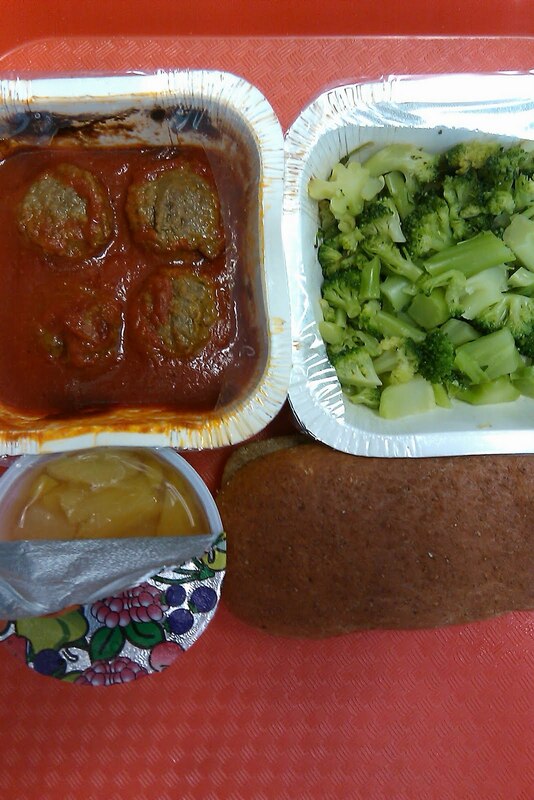 Many of the meals simply look disgusting. I just started reading your blog recently, so I don't know if it's come up before, but the actual packaging and presentation really give bad first impression. It seems almost like space food or something, but not half as cool. Is there someone who serves the food or is it all just grab whatever boxes you want? The lunch servers at the school where I teach make the teachers eat their veggies just as much as the kids! I'm with you Mrs. Q. At such an important stage of physical development what we're feeding our children is really important. I'm so sick of fruit cups and I'm not even the one eating them! but have you noticed gaining or taking off any weight by eating the school lunches all this time? Is it just me or does that look like more food then on other days? I applaud Mrs. Q for bringing attention to a very important issue, even if it's easy for the occasional reader to comment that the food doesn't "seem" that bad, which is still a long shot from saying it looks remotely appetizing. I don't see many others lining up to eat school lunch voluntarily! And personally I think about this site every time I sit down to eat a lunch I've prepared for myself. I feel like there's an attitude in the US that it's somehow elitist to care about the food you are putting in your body. It's one of our most basic needs and both research and common sense show that a varied, well-balanced diet rich in fresh fruits and vegetables is best. Thank you for caring about your students, their dietary needs and your health and especially for documenting it in this blog. The meatballs in this picture made me think of a news article I just read about processed meat. It seems you eat processed meat pretty regularly at lunch- I'd be interested to compare what your doctor finds to this study. All-in-all, this meal is much more well-balanced than many of the ones you consume at school. One meat serving, two carb servings (and whole grain to boot), a veggie, and fruit and even a dairy if you drink the white milk. I would estimate 2 fat servings (one for the meatballs and one for the milk,) too. Really, these are reasonable exchanges for a growing child. This meal would have fit into my diabetic (aka healthy) diet when I was a child. The only thing I am not sure about is the potential for added sugar in the tomato sauce and fruit cup … that could increase the carb content. Sure, fresh fruits and veggies and higher-quality meats would be better, but this meal is leaps and bounds healthier than the chili/corn/white rice combo with the corn chips, and probably costs the school roughly the same amount. Mrs. Q, I wonder if it would help if you told the kids every day before lunch that you'd like them to try everything they are served. I'm guessing that the staff on lunch supervision duty aren't reminding the kids to eat the veggies and fruit. The only pics that bother me are the ones of the pizza…gross. I feel bad for the kids who have to eat this stuff. It looks terrible. It is so over-processed. Sometimes, I can't even identify the food by looking at the pictures and that is just sad. Having Celiac, I would not be able to eat these school lunches. I would have to opt for the salad bar line (if it exists) and most likely, bring my own dressing. In a way, I guess I am blessed to have Celiac and other multiple food allergies. This way, I can be selective about my food and not have to eat processed junk. I have noticed that your early complaints about meals have almost completely disappeared. I am not sure if this is due to better quality of the food items or if youhave just figured out that certain foods (when eaten frequently enough) don't necessarily taste bad. 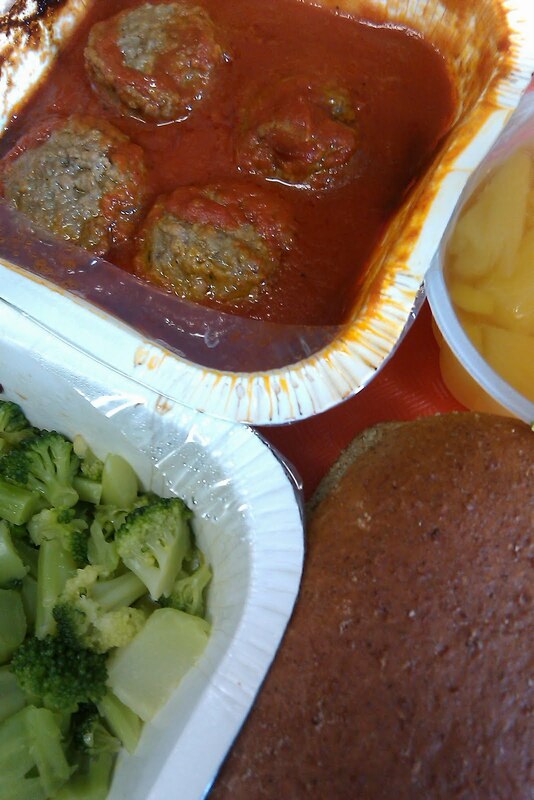 I ate school lunch a few times a week for 13 years and I never really thought that it was poor in taste or quality. I was just looking at the NPS website the other day! I have no children of my own, but I grew up in Norfolk and was curious to see how the lunch program compares to how I remember it. It actually seems better in a lot of ways, and only worse in a few. I found it incredibly heartening to see salad offered every day at every grade level, and no "branded" pizza available until high school. Yay Norfolk! "A reader emailed me to say that she feels so badly about what I'm eating that she can no longer check the blog frequently. She said it's always the same thing and that it's hard to watch me eat it. I know it's tough to see. I just think about the kids." My goodness, get over yourself! For many kids this could be the only meal they get in a day. I came from a fairly poor high school where many ate the free/reduced lunch. I qualified for the program but fortunately I packed my own lunch. More from pier pressure if I am being honest. Eating the school lunch saved me time in the morning, as I have, for many years, had to pack my own lunch. Really though, it's very inconsiderate for people to say it disgusts them to see that food everyday, for many people it's there only option for lunch, and perhaps their only meal. I recognize what you are doing, but it sounds extremely pretencious to talk about the food like this when there are so many who go without basic food.